Skyline is your best choice for island exhibits of all sizes. Skyline has the scope and experience to help you generate leads and build your brand. And with our worldwide network, you'll get responsive service and support around the corner and around the globe. Look like a leader! Skyline's stylish trade show booths are perfect for exhibitors requiring high-design and structure to show off their product or company image. 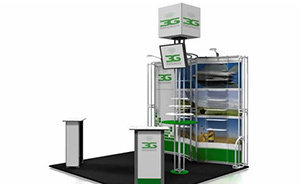 We'll help you stand out above the other trade show booths. Our services don’t end with trade show exhibits. We also build custom office interiors, interactive multi-touch screens, retail fit ups, even exterior signage. Our team can provide design, fabrication, and installation for your unique Branded Environment. Tell us what you need!